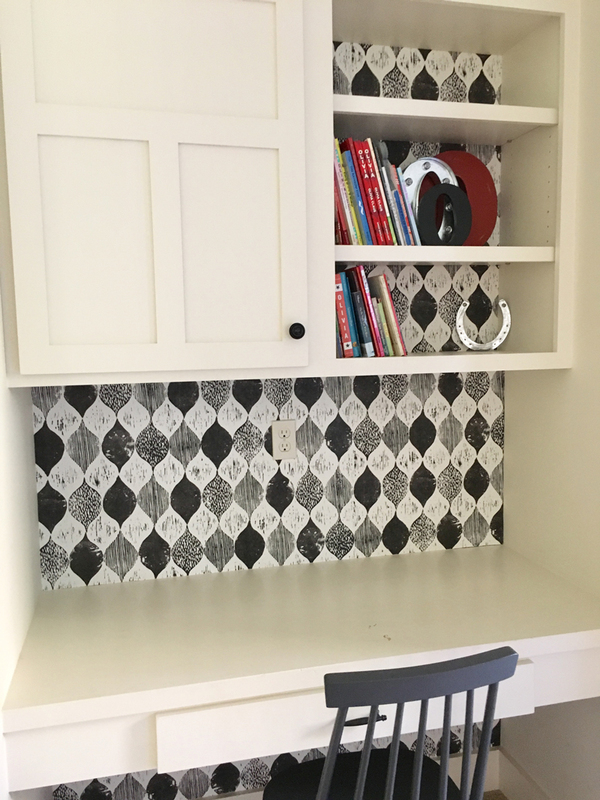 The first small space I tackled was the built-in desks/bookshelves in our kids' playroom. I've never really done a whole lot to decorate it. My kids were younger when we first moved in and this space has just been a toy dumping ground since then. Now that the kiddos are getting older, I've been looking for options to make this space fun – but also a little more sophisticated. The playroom has an area of built-in desks and bookshelves that has always seemed very “vanilla.” While there is absolutely nothing wrong with vanilla (it happens to be my favorite ice cream flavor), I really wanted to find a way to make these areas pop! As I started looking for inspiration to set these desk areas apart from the rest of the room, wallpaper came to mind. Wallpaper is back in a huge way, and there are so many different options out there. 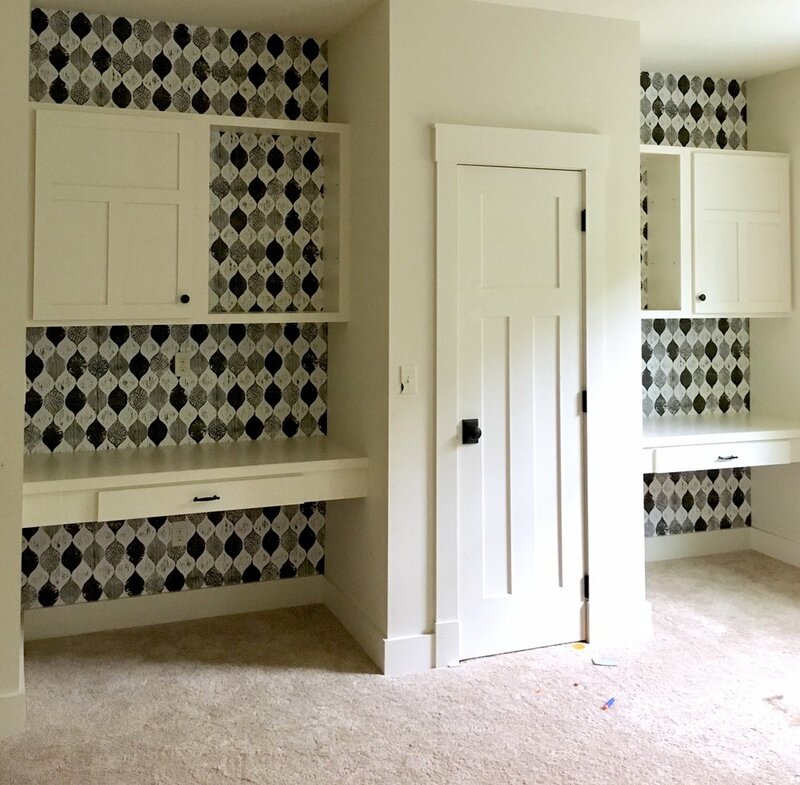 For the built-ins, I chose Magnolia Home wallpaper in the black Woodblock Print. The black color adds a modern feel to a weathered pattern that is reminiscent of a vintage woodblock print or canvas. I thought it was playful and elegant all at the same time. I can never resist a little vintage-mod mix! To make the small space behind the built-ins feel bigger, I took the wallpaper all the way to the ceiling and the whole way down to the baseboard. This draws the eye both up and down, creating the illusion of a taller space. After the wallpaper was installed, I put the shelves and books back up and added a quirky starburst light in matte brass to complement the black wallpaper. I also let my kids add some of their own decor items to the mix. I've found that when I give my 6 and 7-year-olds freedom to personalize their own spaces, they not only feel proud, but they also take more ownership in keeping those spaces tidy. A win-win for everyone! These desk areas have become homework central in the weeks since we did our mini-makeover. The wallpaper adds such a pop of personality and really turns what used to be a "blah space" into a fun and energetic dose of the unexpected. 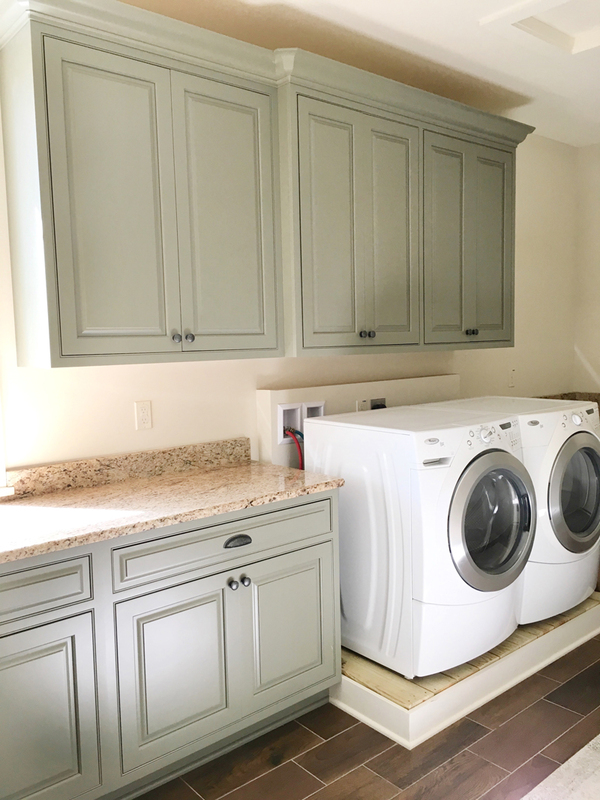 The second small space I wanted to amp up was my laundry room. I feel like laundry room layouts are either absolutely amazing or extremely challenging to navigate. Mine is definitely the latter. The room itself is a very narrow, long space with cabinets and the washer/dryer all on one wall. 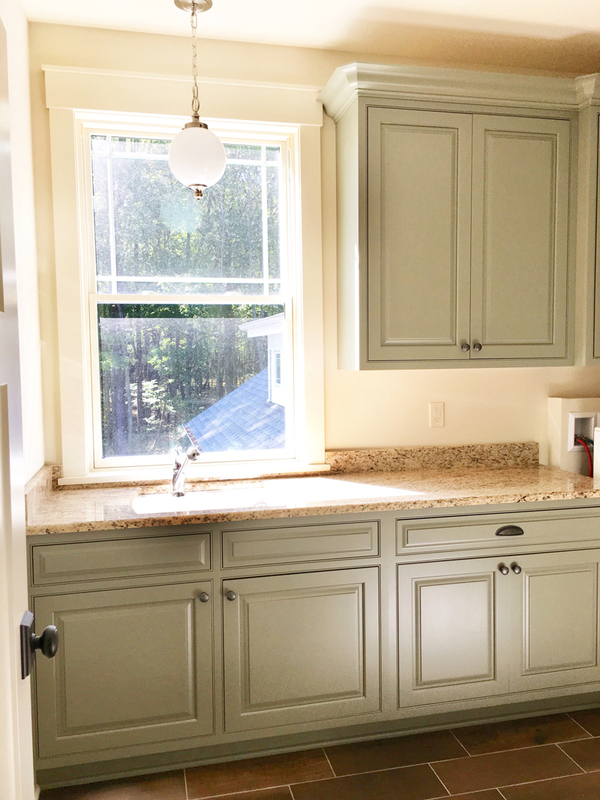 In designing this room, I wanted a dusty sage green-gray for the cabinets, which I paired with aged iron hardware. I checked those two things off the list when we were building, but that's about as far as I got. After we moved in, other things took precedence and I never really finished this room. I wanted to do something unique in here to make this small, awkward space shine. The minute I saw Magnolia Home's Homestead Wallpaper, I knew it was "the one." 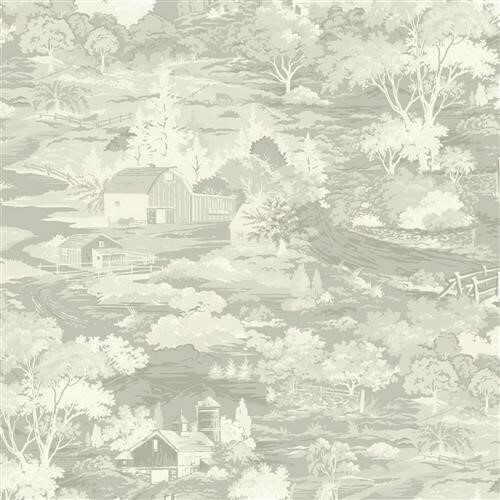 It's a toile-inspired pattern that captures rural scenes, barns, fence rows and trees – in a perfectly beautiful way. Given that we live on our family's 7th generation farm, I was so drawn to the rustic charm of this pattern. It definitely has special meaning for me and it was exactly what I had in mind for my laundry room. I chose the gray color and installed it as an accent wall behind the cabinets and washer/dryer. As you walk into the room, you're faced with this huge expanse of wall, so my goal was to make that wall its own statement art. This scenic wallpaper helped me accomplish that with ease. It's like a giant tapestry! 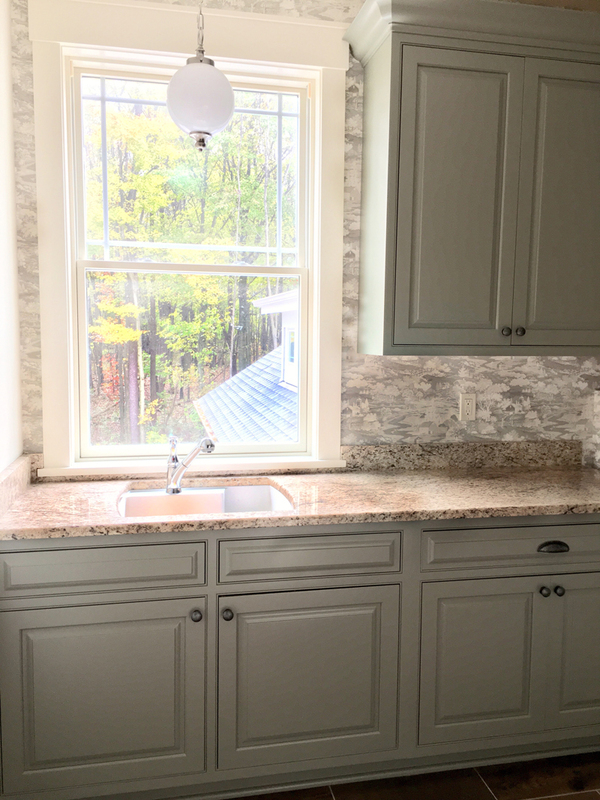 The muted gray color makes the pattern a little more subtle, providing the perfect backdrop for the gray-green cabinets and iron hardware. Hanging wallpaper in small spaces – like the backs of built-ins or even on stair risers, can create a huge impact. In larger areas like accent walls or even entire rooms, wallpaper acts like an oversized piece of artwork. How would you use wallpaper to add personality to your home? My suggestion is to start by requesting samples so you can do a side-by-side comparison of your favorites in your space. With Calico, it’s easy to get your project started and turn your ideas into reality! Click here to shop Calico’s entire wallpaper selection.